The Broadcasting Authority of Ireland (BAI) has launched on 28 March 2017 its revised General Commercial Communications Code, which sets out the rules that Irish radio and television stations must comply with when it comes to airing advertising, sponsorship, product placement and other forms of commercial communications. The revised Code will come into effect on 1st June 2017. This Code shall apply to all commercial communications carried on broadcasting services operating under contract with the BAI or established under Irish statute. It was developed by the BAI following a statutory review of the current Code and a public consultation on a revised draft. Updates made in this latest revision include rules regarding commercial communications for financial services and products; and the provision of greater clarity on the distinction between sponsorship and product placement. Under the revised Code, mandatory regulatory statements in radio advertisements for financial services and products are excluded from the calculation of advertising minutage, the number of minutes broadcasters are permitted to devote to advertising within any hour. The Code also clearly defines the difference between product placement and sponsorship: if a product or service is built into the action of the programme, it is product placement; if sponsor announcements or references are shown during a programme but are not part of the plot or narrative of the programme, they qualify as sponsorship. 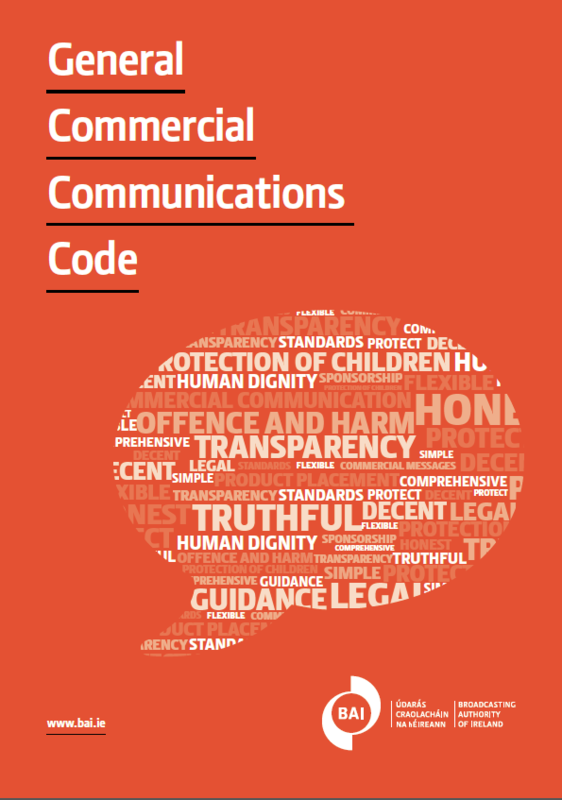 The aim of the revised Code is to give the public the confidence that commercial communications on television and radio are legal, decent, honest, truthful, and protect their interests. It is also intended to provide greater clarity and certainty for Irish broadcasters on the standards that they should apply.